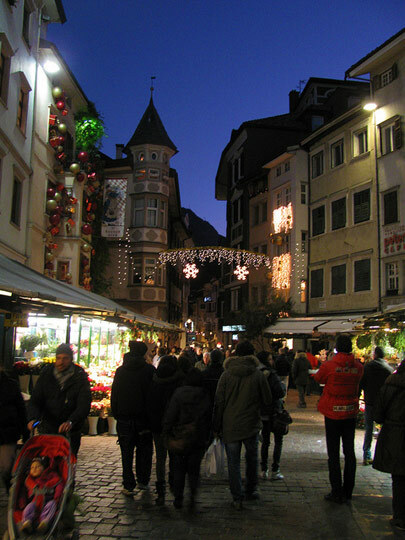 Due to its proximity to Austria and Germany, the Trentino-Alto Adige region in Northern Italy has a long tradition of Christmas markets. Everywhere in South Tyrol, and especially in towns like Bolzano, Merano, Bressanone, Brunico and Vipiteno, as well as in the Trentino province, in towns like Trento and Levico Terme, there is a wonderfully festive atmosphere in the city squares around Christmas time, with stalls selling everything from local food specialties, to woven items, wooden toys, traditional ceramic ware, Christmas decorations and candles. 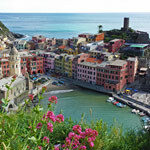 Many of the larger Italian cities, like Rome, Milan, Florence, Bologna and Naples, also have their Christmas market. 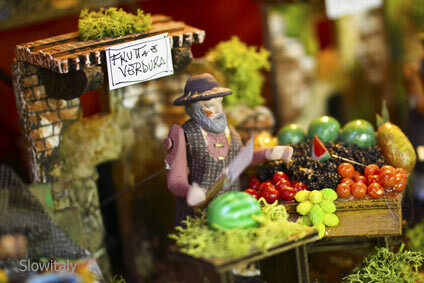 Naples is particularly famous for its many workshops selling presepe (crib) figurines. 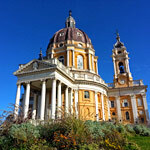 Here is our selection of some of the best Italian Christmas markets. 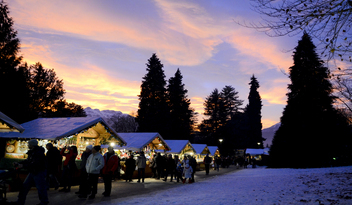 Trentino’s Christmas markets are considered by many some of the best Christmas markets in Italy, not only for the quality and variety of stalls, but also because they are hosted in such a beautiful setting. Traditional wooden huts selling a variety of Christmas goods are set up in the towns centers, offering typical Christmas market items and some of the Trentine culinary specialties, such as Strudel or Tortel di patate, or Polenta agli Strauben. 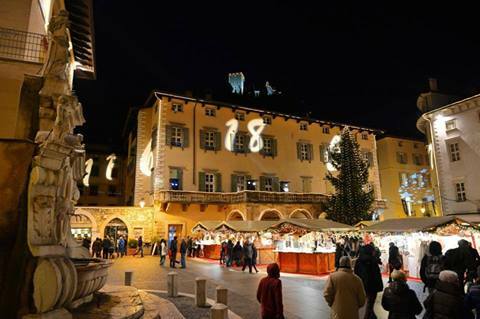 Trento: from November 22, 2014 to January 6, 2015 (closed on Christmas day). 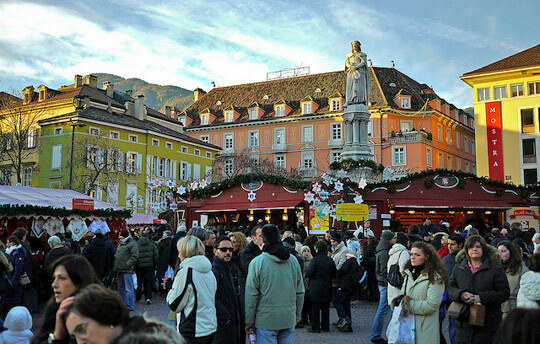 The 2014-2015 edition of the Trento Christmas market will be twice as big with wooden huts selling Christmas and traditional goods both in Piazza Fiera and Piazza Cesare Battisti. 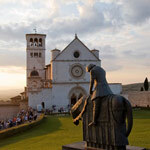 The traditional Nativity Scene will be hosted in Piazza Duomo. 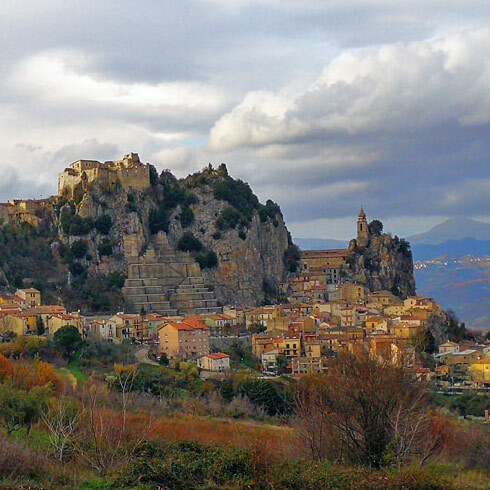 Levico Terme: from November 22, 2014 to January 6, 2015. 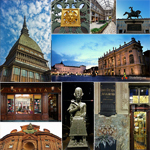 Rovereto: from November 22, 2014 to January 6, 2015. Rango: November 29; December 6, 7, 8, 13, 14, 21, 2014. 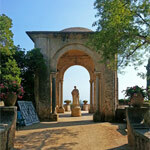 Cimego: November 30; December 6-7-8, 13-14, 20-21, 27-28, 2014. 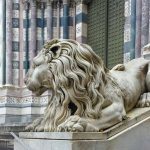 Mezzolombardo: November 21 and December 24, 2014. 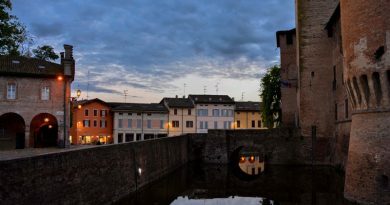 Canale di Tenno: November 29 to December 21, 2014. 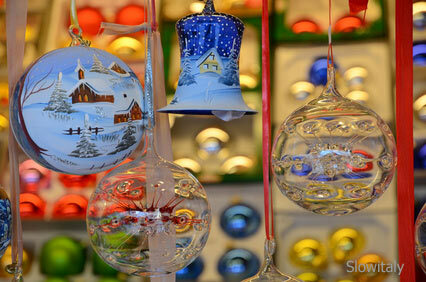 For the Christmas markets of South Tyrol, see: Top 5 Christmas market of South Tyrol. 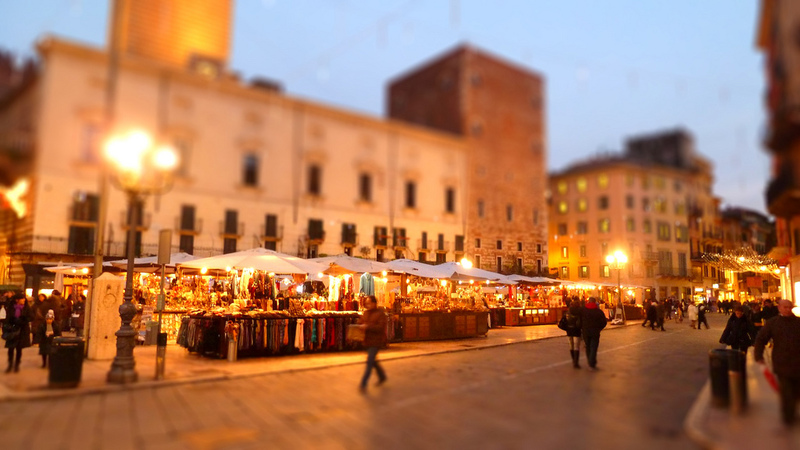 Verona holds a huge Christmas Market with over 300 stalls and tables from November 21 through December 28, 2014. 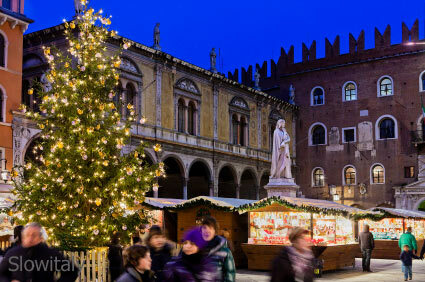 Each year, Verona is celebrating Christmas with a series of events called VeroNatale. 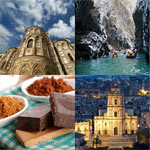 The city is illuminated with festive Christmas lights, nativity scenes from all over the world are exhibited inside the underground passageways of the Roman Arena, the squares welcome Christmas markets with crafts, Christmas gifts and local sweets and food. 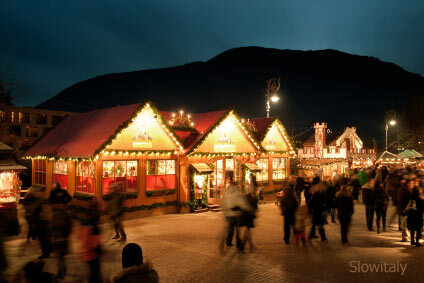 One of the most famous and most popular Christmas markets of the Italian Alps is the Christkindlmarkt of Bolzano, with about 80 exhibitors and a special market in Piazza della Mostra dedicated to the younger visitors. Concerts are held under the Christmas tree on Saturdays and Sundays. 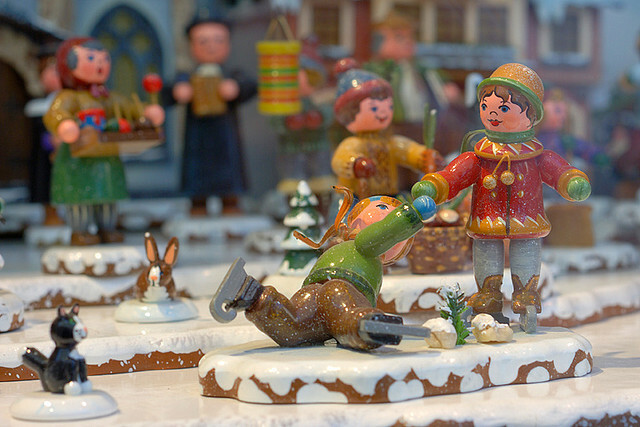 See also: Top 5 Christmas markets in South Tyrol. 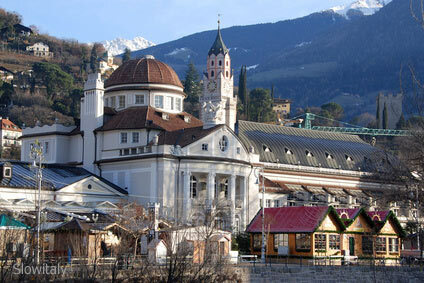 Merano (Meran) hosts one of the beautiful Christmas markets of the ‘Road of the five stars‘ (Percorso delle cinque stelle). Among the many activities for children organized in Merano, you have The “Little Star Club”, which welcomes children aged three to eight. There they can play games in the biscuit bakery, while their parents enjoy the Christmas shopping. There is a big ice skating court in ‘piazza delle Terme’, right in front of Merano’s famous thermal baths and two mini-trains circling around the Christmas Market. Natale a Merano will be open every day from 9:00 to 17:00 from November, 28th to January 6th, from 10:00 – 19:30 on weekdays and 10:00-20:00 on Fridays and Saturdays, 10:00 to 19:30 on Sundays and 10:00-16:00 on Dec 24 and 31 and closed on the 25th. Rome has one of the most enchanting Christmas markets of Italy, hosted in a beautiful setting among the fountains of Piazza Navona. 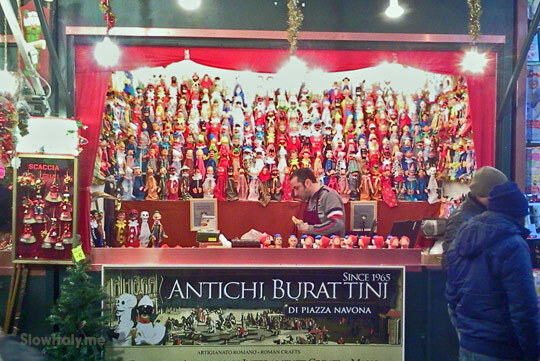 Stalls sell everything from Burattini (a humble and popular version of the marionette), Befana puppets and nativity sets, to sweets and typical Christmas items. 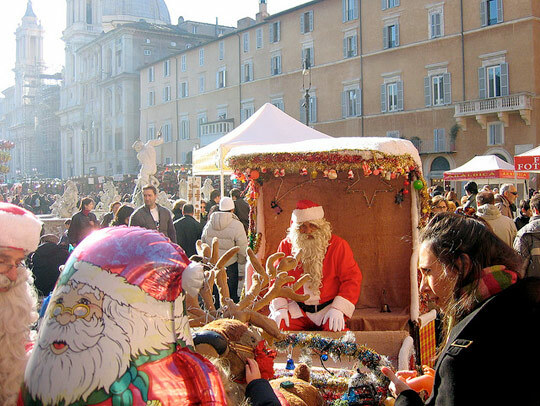 There is also the more characteristic Christmas market at Piazza dei Re di Roma with stalls selling gifts and typical Christmas food, similar to the tradition of Advent markets in Germany and Austria. 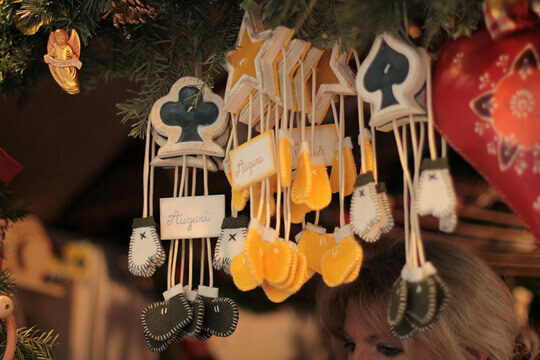 Naples holds a traditional Christmas market near Via San Gregorio Armeno, also known as the “Crib Street” (Via del Presepe) because of its many little workshops specialized in the manufacture of cribs. In December the street becomes a huge presepe (crib) market, selling thousands of nativity scene statuettes, but also figurines representing various trades as well as caricatures of celebrities, with an incredible offer of accessories for decorating and animating cribs, making it possible to build an entire, lively, village around the crib. 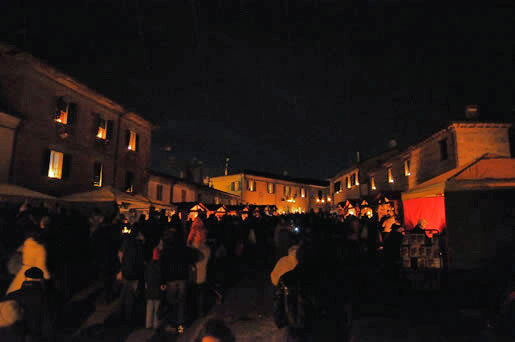 Candele a Candelara, the Candelara candle light festival, is the first Italian Christmas market dedicated to candles. During celebration candle light replaces all electric light for short intervals. 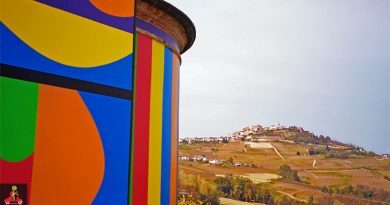 It is a unique event taking place in Candelara, a medieval village in the hinterland of Pesaro, during which the candle is being celebrated not just as a decorative element, but also as an object of festivity. 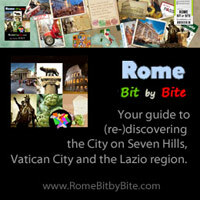 The name of the town itself is etymologically derived from the term for candle in Latin candelaria. On that occasion all electric light are turned off for 15 minutes and the city is being lit by candles only. This unique celebration can be admired on November 29 and 30, December 6, 7, 8, 13, 14 at 17:30 and 18:45 for about 15min. 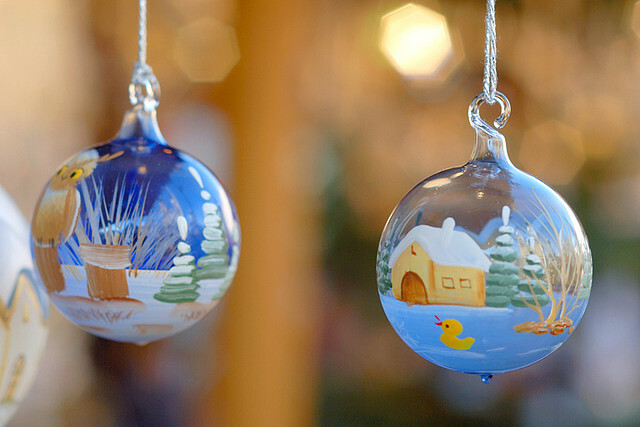 A Christmas market will be held from November 29 to December 14 from 10:00 to 22:00. 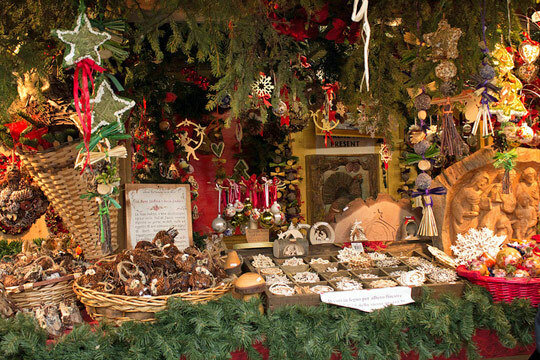 A typical Christmas market with local produce, Christmas decoration and Christmas presents, such as cribs, candles and natural products, Tyrolean slippers, alpaca sweaters, scarves, gloves and hats, blown glass angels, wooden flowers and lanterns. 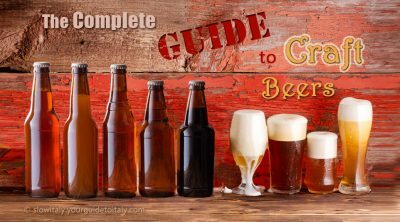 Delicious food and wine products include mulled apple wine, roasted chestnuts and local specialties, such as cheese, honey and jams. The Christmas market will be open from November 21, 2014 until January 6, 2015, on Fridays, Saturdays and Sundays from 10:00 to 19:00. 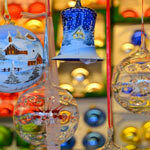 On Sunday 7 December the Christmas market will be exceptionally open until 21:30. You surprised me! 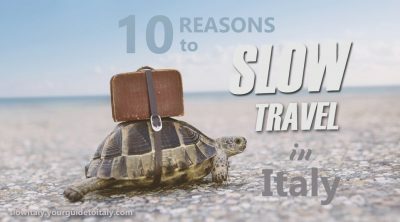 Now, after Vienna, I would like to visit some Italian Christmas market! Surely the ambiance is wonderful!